Welcome Dreammakers, to COSMO'S PULP HEROES CAFE... where all dreams are possible and where Heroes that were, always will be. Sit back now in a soft lounge chair, with your favorite merlot or cappuccino and a favorite friend, and drift with the fog, filling your imagination with the dreams that are and may be. We Pulp Book Writers and Filmmakers are creators of worlds, dreammakers and sculptors of the imaginary, carving characters and worlds out of thought, and bringing forth through the magic of illusion ...that which might be, and for 300 pages of precious time...is ... if but for a moment. "WHO KNOWS WHAT EVIL LURKS IN THE HEARTS OF MEN?" .... THE SHADOW KNOWS! This extraordinary site will introduce you in the manner of an encyclopedia to heroes and heroic figures published from, roughly, 1902 to 1939. It is not restricted only to the pulps, either, although the many characters from that medium will constitute the majority of the entries on this site. It includes characters from "respectable" fiction and comic strips and radio shows and children's fiction as well as pulps and adventure fiction. Sections include brief historical information, pictures, a bibliography and links to other pulp sources. These sites very creatively include information and images about the great pulp heroes of the past, heroes who date from the Pulp era in the 1930's, plus those characters who came later that were inspired by them. Pulp fiction magazines were the main source of everyday entertainment for the masses during the first half of the 20th Century. These magazines delivered action and heroes that were some of the most creative in literary history. Pulp heroes and their authors have influenced every medium including comics, movies, and television. Long before TV, when movies were silent and radio was rarely heard, the pulp magazines burst onto the scene. The cheaply produced magazines offered an eager populace with a pastime that carried them to far–away places on adventures far beyond their everyday lives. Those stories live on in the brittle pages of the aging pulp magazines. Collected on these virtual pages of ThePulp.Net are articles and information about the pulps and scores of links to sites with even more details. These characters were the stars of the "pulps," and in a way they were the spiritual forefathers of James Bond. Though separated from the works of Ian Fleming by time, cultures and philosophy, even a casual examination of the pulps reveals some remarkable parallels to the Bond mythos. 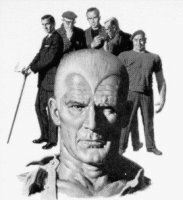 Nostalgia Ventures has picked up the rights to reprint The Shadow, Doc Savage and The Avenger pulp novels. The trade paperback reprints feature two novels per book, with interior illustrations from the pulps and new essays. A marvelous opportunity for fans of the pulp heroes. fiction author Philip José Farmer postulated belonged to the same genetic family. Are you ready for some Extreme Fiction? Reviews of classic adventure stories, pulp novels, obscure movies, cliffhangers and Old Time Radio by the Good Doctor. have been reviewed, as well as the new adventures by Will Murray and Philip Jose Farmer. The Doctor's in so come on in! One of the finest fan sites dedicated to the Shadow. Tons of resources, downloads and Shadow links. The place where you can find all your shadow needs. Here comes the Fleshless Legion down 5th! The Eyeless Legion has staked out Bleeker! And there, on the A train, aren't those Legions of the Accursed Light?!? This is not a job for a hero that shoots webs...this is a job for a hero that shoots first! the world to create a definitive Sax Rohmer bibliography, reference and archive. The Fantômas website is devoted to the Lord of Terror, the anti-hero of the French detective thrillers written by Pierre Souvestre and Marcel Allain. The Thrilling Detective Web Site is devoted to fans of hardboiled private eyes and other tough guys and gals. The site covers fiction, film, television, radio and comics, and offers bibliographies, trivia, links, and more. This page is lovingly dedicated to the TV series "The Avengers"
and to all fans of this wonderful show. The action/adventure film first became popular with weekly Saturday serials, running in installments that often had 'cliff-hanging' endings to entice viewers to return for the next show. Other action-adventure heros of B-picture adventure films included Kane Richmond (as the "Spy Smasher," "The Shadow," and a star in the "Cliffhanger Serials" and the "Rin-Tin-Tin" adventure serial), Tom Tyler (as "Captain Marvel" with countless episodes, and "The Phantom of the West"), and Don "Red" Barry (as "Red Ryder"). See Spy Smasher in the flaming tunnel, an animated GIF from Spy Smasher.